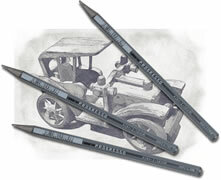 These excellent graphite sticks come in five different grades and are perfect for a variety of sketching techniques. Use on their side for heavy shading or sharpen to a point for more detailed work. The Progresso sticks have a lacquered outer ensures clean handling. The Koh I Noor 1500 / 1680 Graphite Pencil ranges are ideal for drawing and sketching with high opacity and lightfastness, clean erasing and are strong and durable. 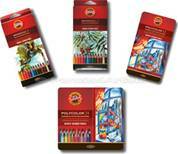 Koh I Noor 3800 Polycolor Pencils are artists' permanent coloured pencils for drawing and illustrating. Lightfast, blendable with a high pigmentation and permanent colour. Koh I Noor use special oils to give their pencils a really soft, smooth lay down. Koh I Noor Mondeluz Aquarelle benefit from having extremely pure white clay mixed through every core. This gives a consistently rich, smooth lay down of colour which retains a degree of vividness even when washed with water. In 72 lovely colours. Koh-I-Noor Gioconda 8100 Hard Pastels are a traditional and very popular Koh-I-Noor Hardtmuth product.